When praying for our world, essential oils ( gifts of the earth) can support us in our focus and intention. Oils are mentioned throughout the Bible. There are many citations of oils used for anointing. Two oils were brought by the magi – frankincense and myrrh. There are options for incorporating oils into our worship and rites such as baptism and anointing of the sick. Some people use essential oils for promoting prayer and meditation. 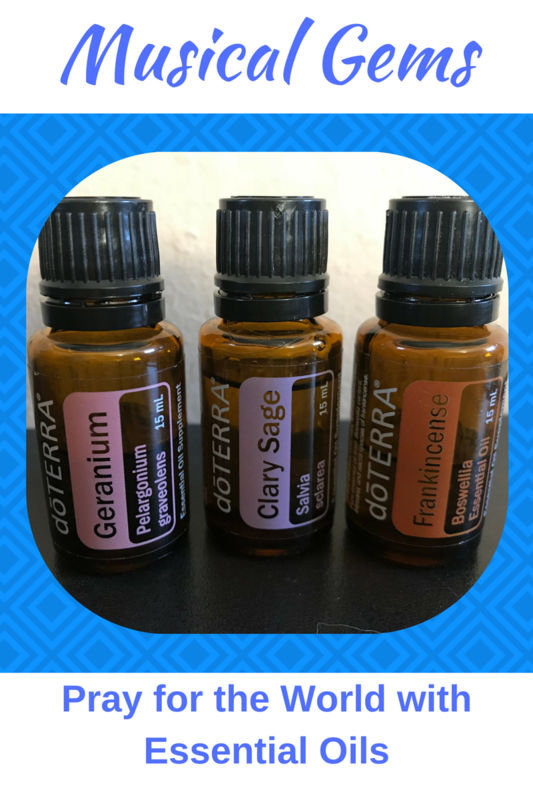 Three that speak to world needs are geranium, clary sage and frankincense. Geranium is known to calm nerves and to lessen feelings of stress. It is known to help clarify thoughts and managing overwhelming emotions. May this oil serve as a guide in healing, tearing down barriers that divide. Clary Sage is a calming oil that clears the mind. It is an oil tied to vision, bringing clarity to life purpose and mission. Many cultures utilize sage in clearing. May this oil serve as a reminder to clear darkness and discouragement. Frankincense reminds you to feel loved and protected. It is the oil of truth, helping us connect spiritually during prayer. May it bring you a sense of peace as you pray. For those electing to use an oil select the one that matches your personal intention or that speaks to God’s spirit within you. Place 1-2 drops in the palm of your hand, rub them together and breathe in the scent for a minute or so. If you would like to learn about other essential oils, please like Musical Gems on Facebook. There you will find announcements about upcoming Facebook Lives sharing more information on essential oils.